Snapshots of coumarin 151 solvated by DMA. The red-shaded DMA are those that can transfer an electron in under a few hundred fs. Note the dynamic variation in those DMA that can undergo fast electron transfer. Dr. Cave’s research involves development of methods in electronic structure theory and their applications to understand the reactivity of atoms and molecules. His group applies density functional theory and conventional ab initio methods to investigate the ground and excited states of chemical systems in order to predict structure, energetics, and reactivity of chemical systems. One area of particular interest in the group has been the electronic coupling element for electron transfer. This quantity is related to the likelihood of an electron tunneling from reactant to product and is of chief importance in determining the distance and orientation dependence of long-range electron transfer processes. We have used the Generalized Mulliken-Hush method to calculate the electronic coupling element in students of through-solvent electron transfer (et), ultra-fast et, tunneling through porphyrin oligomers and the investigation of multi-state effects in electron transfer. Our most recent focus is on the development of approximate, fast, high-accuracy methods to calculate the electronic coupling based on coupled cluster wavefunctions. Another recent focus has been applications of density functional theory to study organic and organo-metallic reaction mechanisms. We have examined substituent effects on i) endiandric cascades (in collaboration with the Vosburg group), ii) ketal Claisen rearrangements (Daub group) and iii) chiral substituent effects in titanium-catalyzed hydroamination reactions. Finally, we have recently worked on general methods to calculate quasi-diabatic coupling elements for high-accuracy spectroscopic studies. 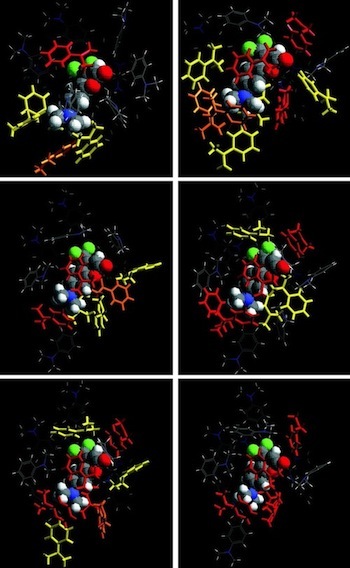 These methods can be used in conjunction with high-order coupled cluster techniques to provide high-accuracy coupled potential surfaces for simulation of molecular spectra.